I'm huge fan of all things pomegranate. I love the antioxident goodness in Pom Wonderful. There's my favorite Gus Dry Pomegranate soda, and when I'm feeling really grown up, I reach for Pama liquor. So when I learned of their limited edition collab with Garrison Chocolates just imagine my excitement! 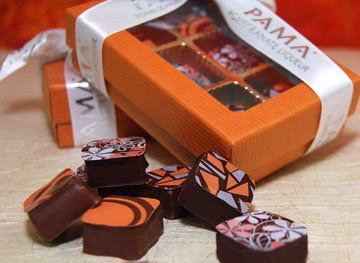 All the chocolates are laced with Pama, but each with one of three flavor variations: Pama Tart-layered ganache and graham cracker crust--Pama Cosmo--chocolate, vodka, and lime juice and my favorite--Nutty Pama-roasted nuts. I love pomegranate as well - however, I'm not a huge fan of fruit in chocolates (unless it's fondue and then it's okay) These do sound interesting, though.